There is so much information out there about solar panels and installation, and so many players have entered the industry, How can you tell that your installer is qualified? Fortunately, a standard has emerged--known as the North American Board of Certified Energy Practitioners (NABCEP). This organization has put forth a set of requirements that, once satisfied, proves that a solar (PV) installer is supremely qualified to design and install any solar electric system. NABCEP is solar's equivalent to the American Bar Association of lawyers, or the American Medical Association of doctors. Same Sun is proud to employ NABCEP Certified Solar PV Installation Professional© . Khanti Munro (Certification #042013-88). 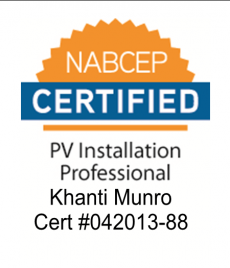 The North American Board of Certified Energy Practitioners, or NAPCEP, is a professional designation program that encompasses both the electrical and building components of solar, as well as safety. The requirements--which are substantial—for the PV Installation Professional designation, require candidates to demonstrate knowledge on subjects as diverse as system design, electrical and job safety, the National Electrical Code, roofing and construction techniques, system commissioning, and troubleshooting. All installers are required to show that they have real-world experience as a senior person on an installation crew, as well as a minimum number of hours of advanced training. FInally, they must pass a rigorous exam that covers the multi-craft aspects of being a professional PV installer. NABCEP is a non‐profit organization governed by a board of directors consisting of volunteer representatives of the solar industry, NABCEP certificants, renewable energy organizations, state policy makers, educational institutions, and the trades. NABCEP’s mission is to develop and implement quality credentialing and certification programs for practitioners by supporting and working closely with professionals and stakeholders in the renewable energy and energy efficiency industries. To learn more visit www.nabcep.org.